Vivalux Wrinkle Cream Review: Is This A Scam Or Legit? Vivalux Wrinkle Renewing Moisture Cream Review: Is This A Scam Or Legit? Just because dryness can be a major cause of skin aging, anti-wrinkle products have been promising left and right, top and bottom, to give you ultra hydrated skin. Can pure, unadulterated, moisture-giving skincare product possibly lift your skin and tighten your pores just by hydrating your skin? Of course not! So, what does it take to make the cut to become a certified anti-wrinkle cream? It should provide your skin with high levels of moisture plus more! Else, your skin wouldn’t be able to take advantage of the added moisture which will only be put to waste if your anti-wrinkle product fails to stimulate natural skin processes that utilize all those nourishing moisture and nutrients. At $80 for every 1 fl. oz. jar, Vivalux Wrinkle Renewing Moisture Cream makes you an oath many other anti-wrinkle products have sung before – ‘this product will give you the skin you had when you were 20’. Right or not? Read on to figure out for yourself. Vivalux Wrinkle Renewing Moisture Cream is centered on the same mantra: increase the moisture to make your skin plump and wrinkle-free. On the periphery, this product claims to improve your skin’s ability to actually use up that additional moisture that comes with the product and help avoid wasting it from trasepidermal water loss. Soft, supple, young looking skin – that’s the reward you will allegedly get for using the product regularly over a long period of time (and, well, for spending $80 every time you replace that empty jar). The manufacturer’s profile, contact details and track record is nowhere to be found. How Does Vivalux Wrinkle Renewing Moisture Cream Work? Vivalux Wrinkle Renewing Moisture Cream banks on the skin invigorating powers of natural, botanical ingredients fused with the skin revitalizing nourishment which can only be made possible by synthetically prepared ingredients. This anti-wrinkle cream is also formulated to flood your skin with skin precursors that include phytoceramides sourced from plants. Phytoceramides closely resemble the skin’s matrix and structure, making it an ideal external material to be introduced to the skin. This way, your skin is able to easily absorb and assimilate these phytoceramides and immediately use it to reinforce the skin’s natural barriers so that your skin remains protected from further, more severe surface damage. Synthetic peptides are also incorporated into the product’s formulation. These ingredients work their way deep into the skin. Their amino acid content binds with the skin precursors naturally produced by the skin, significantly cutting down on the skin cell turnover process so you can get younger skin at the shortest possible time. Cleanse. Tone. Apply product in circular motion. Product contains phenoxyethanol which may cause permanent damage to the central nervous system. Product works best for women and men in their 30s and beyond. 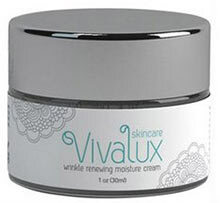 Vivalux Wrinkle Renewing Moisture Cream does make the cut above merely providing additional moisture for your skin. Will you reap wonders from this product? You know that you got to try it to find out for real.